If you’re looking for start-up business ideas, try exploring why event management is the ideal business start-up opportunity. These events can range from very simple affairs to complex extravaganzas, requiring a greater degree of logistical input. An event management business requires little effort or cost to launch and almost unlimited income potential while remaining fun and relatively low-risk. Although the type of events will vary widely, some typical examples of events you might manage include birthday parties; weddings; graduations; anniversaries; christening, and bar mitzvahs. In fact, virtually any kind of occasion could require a special event. In addition to private events, there are also corporate events such as product launches, team building events, sales meetings, or end-of-year events. 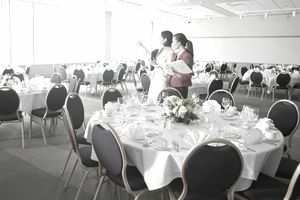 The list of corporate event planning opportunities (as well as non-profit fundraisers) available to an event planner is extensive, which means there is a long list of opportunity for someone who recognizes what makes this business sector well-suited for startups. Almost Unlimited Income Potential: The types of events mentioned above are the tip of the iceberg. The potential client roster available to you is huge. In terms of potential, you are only limited by your imagination. Low Business Start-up Cost: Among the many start-up business ideas, the event management model is hard to beat. You don’t need an office and you can hire contract employees on an as-needs basis. Also, unlike many other businesses, you don’t need to carry stock of any kind. If you want your own event management business, you can get the ball rolling for a very minimal cost. Minimal Risk: Because you don't need to invest in many of the fixed costs (i.e., office space and equipment) associated with other business start-ups, your downside risk is kept to the absolute minimum. Positive Cashflow: As a business owner, you have the luxury of deciding what payment terms to extend to your clients. However, in event management, 50 percent paid in advance and the balance paid in full, before the event, is very common. Because you're not waiting 30-90 days for payment, you're not facing the cash flow issues many new businesses face. Just as important, because you're paid before completion, you don't have to chase after the money, the way some business owners do. Repeat Business: The holy grail of any business is clients who come back time and time again. It’s far easier to do repeat business with existing clients than to continually have to find new ones. Corporations will always give you repeat business if you do well, and private individuals will likely recommend you to friends and family if they're pleased with your work. Accessibility: Because event management has grown in popularity as a business start-up, the availability of online event management courses has proliferated. It's easy enough to do a Google search to find the best one for you. Efficiency: One major benefit of event management is the possibility to automate many of the required tasks by using the available software. There are many excellent software packages available in the marketplace today that will help you organize and run your business efficiently. Build a Substantial Asset: An event management operation, especially one with repeat corporate clients, is a valuable asset that you can sell, or pass on to a family member. Dynamic Industry: People become involved physically and emotionally in their events and actively seek out good event planners. The end result is a rewarding career where you're engaged and interacting with people. Fun: Running an event management business can be an upbeat and fun experience because the events you're orchestrating are happy occasions.